I can’t believe it has been exactly three months since I moved back to Florida from Los Angeles. I wrote about the transition just two months ago (read that post here: http://stand-uplibrarian.blogspot.com/2012/02/floridian-of-month.html) and now I know that it was one of the best decisions I have made in years. In leaving, I not only found what really makes me happy, but I also have the support that helps my talents grow in the right direction. You can have all the talent in the world but without the right team of people lifting you up, it is meaningless. It is never easy creating something that nobody has ever done before and while my goal for StandUpLibrarian.com was always to educate and entertain people about libraries, I forgot how difficult it was going to be to educate people about who I was!!! Yes, I am a librarian with a Master’s degree. Yes, I am a comedian too. Hence the name: Stand-Up Comedian + Librarian = Stand-Up Librarian. 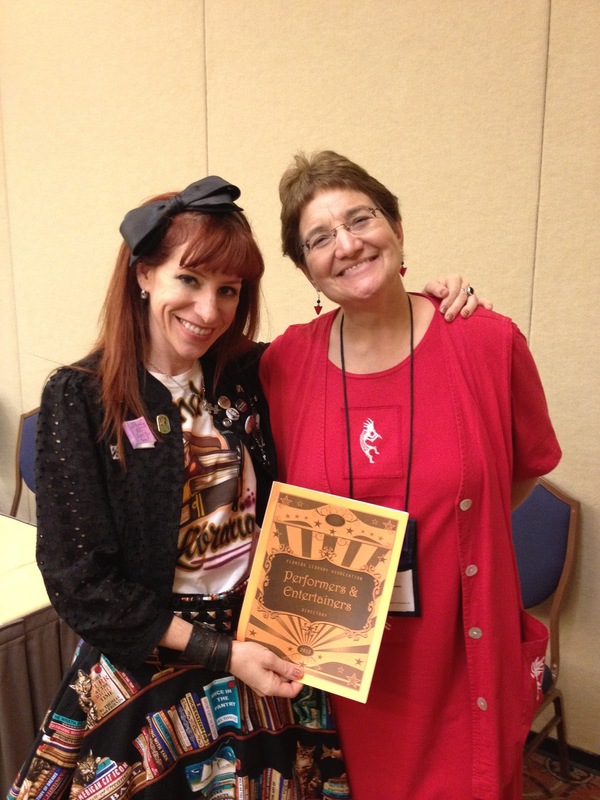 So you can only imagine how truly joyful and excited I feel at finally seeing all of my work take flight at the Florida Library Association’s 2012 Annual Conference last week. Two years ago, there was no StandUpLibrarian.com. I was just a student at FLA about to graduate with my Masters degree from USF. 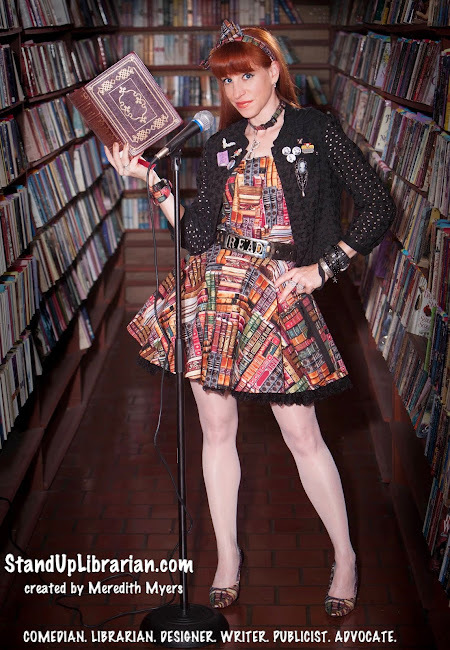 But this year, thanks to one woman’s kind heart, I was able to come back and perform as the Stand-Up Librarian. Just her support in that one decision changed everything for me. In performing, I got the chance to thank the people who have inspired me all these years. 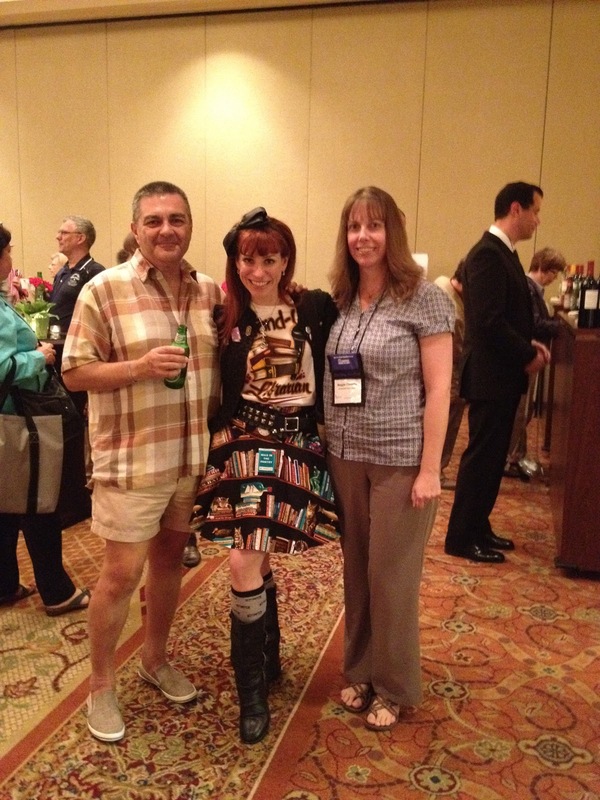 I also got to see and hear a roomful of librarians laughing at my literary jokes. More importantly, I was able to show those students about to graduate that if I can survive without a library job for two years and still have a smile on my face, anything is possible…you just have to believe it & maybe even create it. 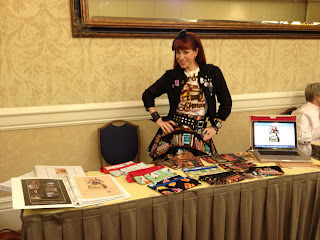 Finally, over at my display table in between hugs and photos, I learned that people loved my literary purses as much as I did…and I SOLD OUT OF THEM! Today, in addition to writing this blog post, I am sewing more bags for all the online orders (to order one, visit my Etsy shop here: http://www.etsy.com/shop/MeredithMyersDesigns.) Plus I am responding to emails about possible jobs and fielding phone calls about future performances. And why? Because one woman believed in me and gave me a chance. Thanks Linda. With Linda Goff, my hero. 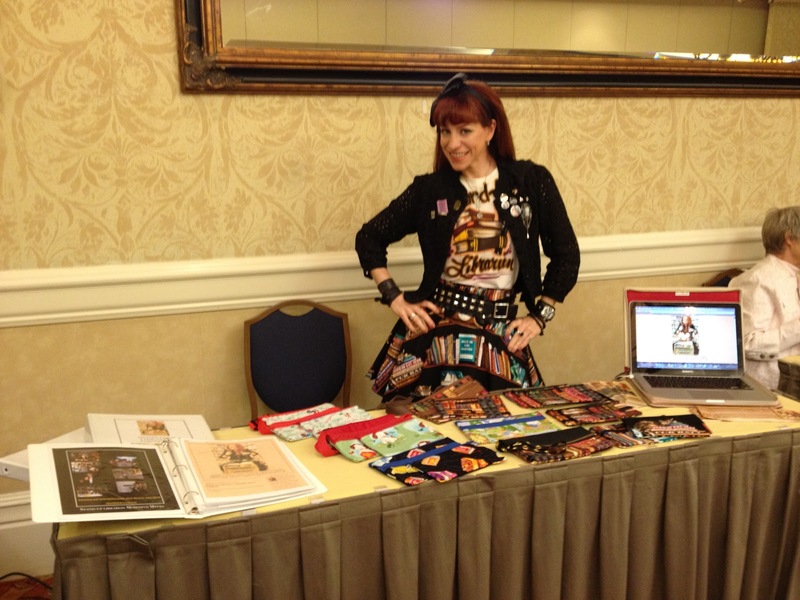 Showcasing my talents at my display table. I would later sell all these bags. With my two mentors - Gene & Maggie. Their support over the past two years has been incredible. So much has been going on that I could write about but I guess I will share the most exciting…I MET OPRAH! 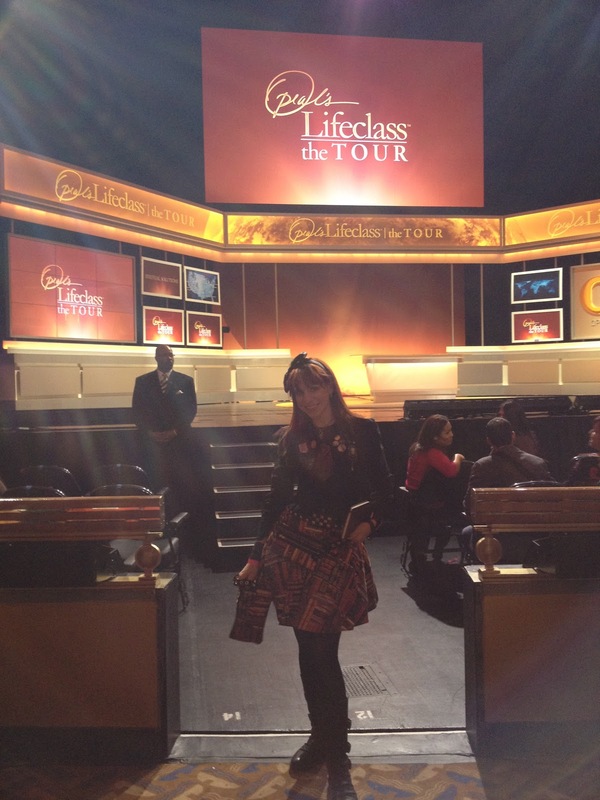 I had remarkably gotten tickets to her OWN show “Oprah’s Lifeclass: The Tour” in New York City featuring life coach Tony Robbins after submitting myself online a few months back. Like a lot of people, I had tried to get tickets to “The Oprah Winfrey Show” for some twenty plus years but never had any luck…until now. It was weird that after being chosen (which was exciting enough), I was then told a week later that I would be sitting in the orchestra rather than the mezzanine as originally assigned. In picking up my tickets, I was then given 6th row. On arrival for the live show on April 2nd, I was suddenly 3rd row. Things just kept getting better, which was a lot like my life since leaving Los Angeles. I had surprised a co-worker from my PR days in NYC by putting her name down as my guest for the show. She had been having a tough time being an unemployed, single parent, having to move home with her mother, and I just knew Oprah and Tony would say something to inspire her to not give up. Secretly I needed Oprah and Tony too. I am strong but even I have days when I feel like my strength is not going to be enough. My friend barely had the $18 for the roundtrip train ride into NYC for the show & my brother had helped me with my flight from Florida, so for us broke, unemployed people to be sitting 3rd row was truly God’s work in motion. I don’t know what you believe in but I’ve always known that a higher power has been guiding me all of these years because it is the only reason I am still sane and hopeful that what I have been though will eventually make sense one day. I was dressed in my librarian attire with book skirt and matching purse from my new literary bag line. Oprah has done incredible things for libraries & literacy, so if I had the chance to thank her, even in just my outfit that perhaps she would never see, I would. The publicist in me also knew to be prepared. Maybe a fellow audience member would like the purse & want to buy one. Or maybe Adam Glassman, Creative Director of O Magazine would see my purse casually hanging off my chair and just have to feature them in next month’s issue! Only we weren’t sitting on the aisle. We were placed two seats over. So we made the decision to move. I know it sounds like a simple task (or a silly one considering how lucky we had been so far), especially when the producers seemed stressed about seating 4,000 more people in Radio City, but here’s the kicker, it wasn’t even my idea! I was actually afraid to piss them off by moving a chair over. I know I know. I have this reputation for being fearless and standing up to injustice and taking the punches from people in positions above me, but I was still scared. 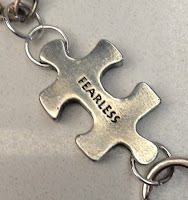 Then I looked at my necklace which had the word FEARLESS written on a pewter puzzle piece (which ironically ended up being the theme of this particular Lifeclass.) The charm was the last thing I had bought before leaving Los Angeles. It was some type of affirmation jewelry that was supposed to remind me that whether I was leaving LA or still an unemployed librarian after two years, I had nothing to be afraid of – things were going to work out. Suddenly moving chairs seemed stupid. Then walking up to Oprah and giving her a hug seemed easy. Yep, that’s right. 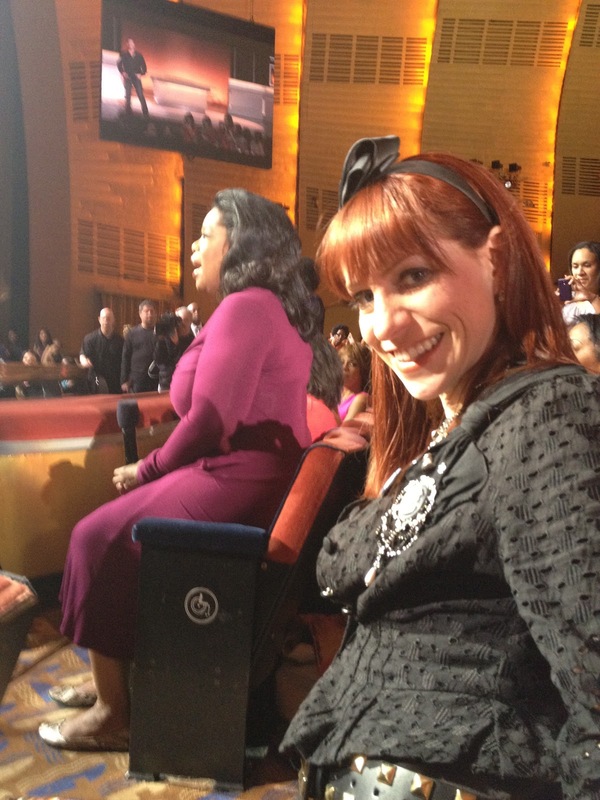 I hugged Oprah. Out of over 4,000 people, I was the only one who seized the moment and went for it. I remember seeing the proof that she was wearing fake eyelashes. The rest was a blur. Obviously our new seats weren’t just good, they were great! We were seated behind all of the people being interviewed for the show. I stood up for Steve not just because I had quit drinking too, but so I could see around his head when Oprah decided to give her shoes to an audience member. Size 10, folks. Heck, her best friend Gayle King was seated just a few seats from us, across the aisle next to Tony Robbins’ wife, and yes, Adam Glassman was there too. Seeing these ‘celebrities’ in attendance was fun (although we had both worked with bigger stars so that is not the point in name dropping here), it was that two unemployed, down-on-their luck girls were pretty much given the best seats in the house…without asking for them. So imagine if I actually asked for something, what I could get! Hence this blog post. It’s not that I met Oprah or went to this show, it is that I needed to learn once and for all to be fearless - all of the time. We all do. We need to stop being afraid that we are going to upset somebody by our choices. I have spent the last two years censoring my jokes and thoughts on the library field because I didn’t want to hurt my chances at getting a job and you know what? It hasn’t made a difference. I am still unemployed. So I will say it now. Oprah, get ready for my phone call - we are doing a show. Adam, get ready for my email - we are promoting my literary bags. And library field, you better start changing your hiring procedures or you are going to miss out on someone truly great. Stop judging candidates by a two-page resume or a short list of qualifications. Most of the people that are going to take this field in the direction it needs to go in order to survive aren’t sitting in the seats assigned to them. We are the ones rebelliously moving to the front. 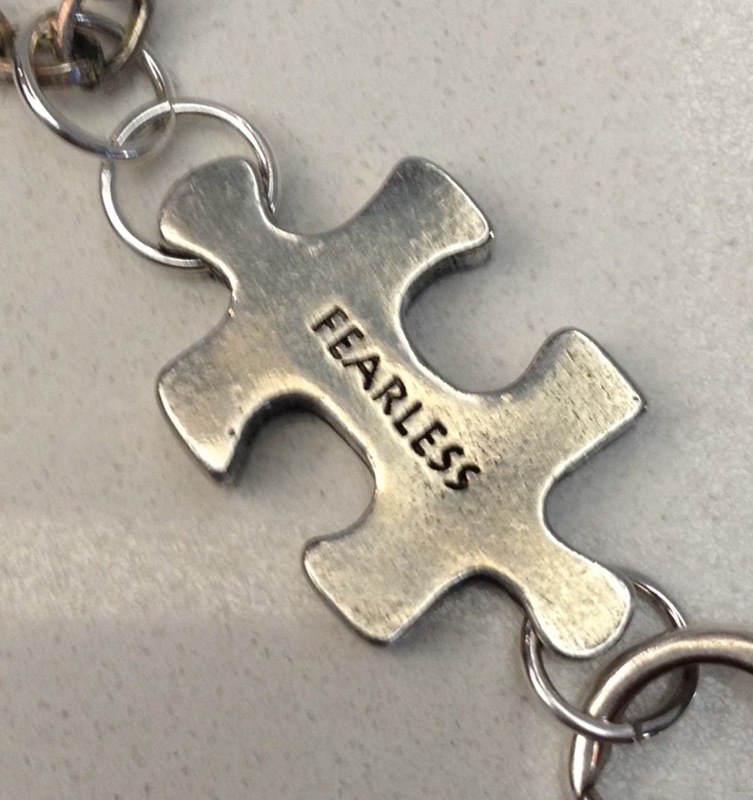 I am FEARLESS. Are you? 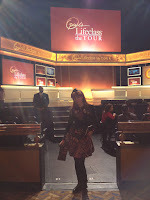 Thank you Oprah Winfrey, Anthony Robbins, and Lifeclass staff.